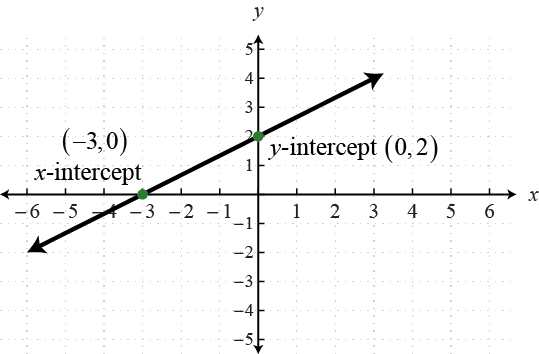 The x-intercept is the point where the graph intersects the x-axis and the y-intercept is the point where the graph intersects the y-axis. These points have the form (x, 0) and (0, y) respectively. Tip 1: To find the y-intercept, set x = 0 and determine the corresponding y-value. Similarly, to find the x-intercept we set y = 0 and determine the corresponding x-value. Keep in mind that the intercepts are ordered pairs and not numbers. 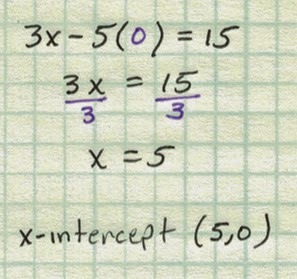 In other words, the x-intercept is not x = 5 but rather (5, 0). Two points determine a line. 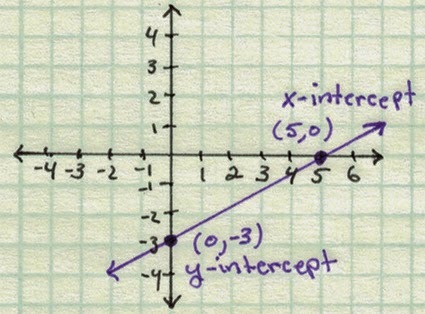 If we find the x- and y-intercepts, then we can use them to graph the line. As you can see, they are fairly easy to find. Plot the points and draw a line through them with a straightedge. Done. Let’s do another one. We begin by finding the x-intercept. The x-intercept is (3, 0). 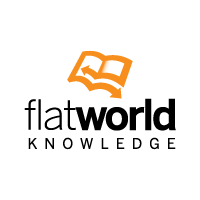 The y-intercept is (0, 9). Now graph the two points. Tip 2: Use Desmos.com to check your answer – it’s totally free. Just type in the equation. This is a nice and easy method for determining the two points you need for graphing a line. In fact, we will use this exact technique for finding intercepts when we study the graphs of all the conic sections later in our study of Algebra. 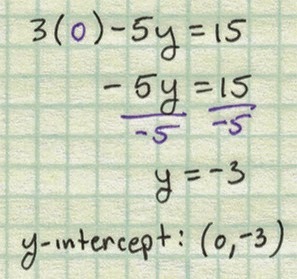 Graph −4x + 3y = 12 using the intercepts. Graph −4x + 2y = −6 using the intercepts. Graph y = −5x +15 using the intercepts. Graph y = −3/4 x + 9 using the intercepts. This brings us to one of the most popular questions in linear graphing. Do all lines have x- and y-intercepts? The answer is NO. 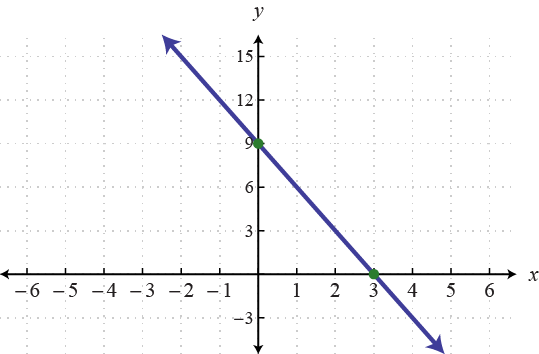 Horizontal lines, of the form y = b, do not necessarily have x-intercepts. Vertical lines, of the form x = a, do not necessarily have y-intercepts. Many students this method, but I will tell you, there is a better way. Even less work... [ Graph Lines using Slope and Intercepts ] Read on!